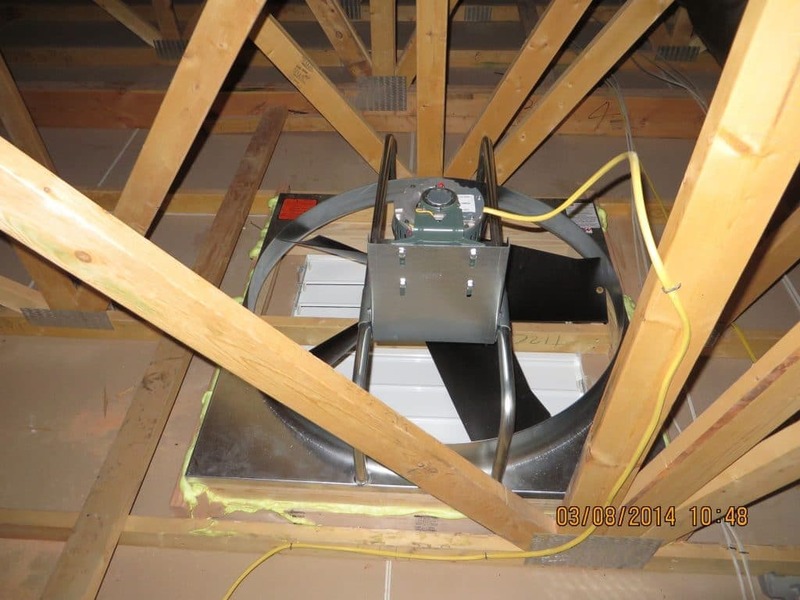 How Does an Attic Fan Work? Everyone knows that hot air rises, which is why in summer the upper floors of a house will be warmer than the lower ones. In hot and humid climates, the air inside some homes can get extremely stifling. In such houses, an attic fan can help with air circulation and cool the attic, making it much more comfortable for the occupants. Attic fans are not very popular in some areas. So in this article, we will explain what they do, how they work and what to look for in an attic fan for your home. We will also look at some top picks for attic fans which would provide exceptional value. An attic fan is a ventilation fan which regulates the heat level of a building's attic by exhausting hot air. It can be automatically turned off and on by a thermostat, while sometimes a manual switch is used. An attic fan can be either gable mounted or roof mounted, and usually requires additional vents to draw in fresh air as the hot air is exhausted. Attic fans are typically used in warmer months when temperatures in an attic can exceed 120 °F (49 °C). Don't confuse Attic fans with another type of fan, known as a whole-house fan. As it is installed in an attic for the different purpose of cooling a whole house. Attic fans work by creating a breeze through the open windows and doors. If the fans are the right size they blow out the entire volume of air in the house in about 3 minutes. The hot air is expelled from inside the house, especially upstairs and in the attic. The hot air that is expelled is rapidly replaced by cooler air from outside, thus cooling down the entire home within minutes. Attic fans, combined with thermostats and humidistats allow you to create a very effective system. So that you improve the ventilation and moisture within your home. 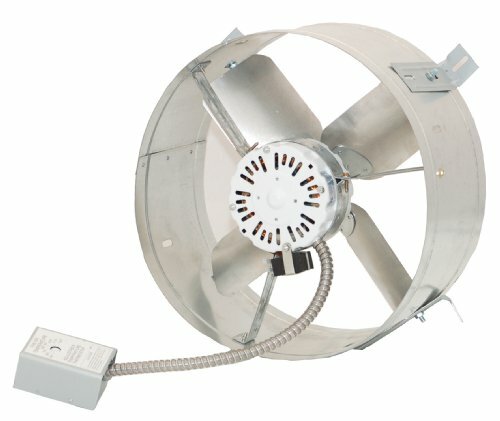 Attic fans are not well known, but they have several advantages. They are smaller than other fans, do not directly blow cool air, and are seen as accessories instead of necessities. They make a big difference in any home for a relatively low price compared to whole house fans, air conditioners, box fans and even ceiling fans. They cost around the same as an average ceiling fan and usually do a better job at cooling the space. Most air conditioners do not cool the attic. So while the house sits at the temperature that is desired, the attic stays hot and keeps heating the home. This causes many homeowners to use their air conditioner excessively. The function of an attic fan is to improve attic air circulation resulting in a healthy, energy efficient home. Attic fans pull hot air and moisture out of your attic extending the life of your roof. In summer months, an attic fan keeps your attic cooler, helping reduce the load on your HVAC system. In winter months, it prevents moisture build-up, mold and ice damming. Attic fans can either be mounted on the roof of the home or alternatively on the gable of the home. Most people opt for gable mounting as it looks neater from the outside. It is also easier for those that don’t like heights or being on the top of a roof. The most common method of wiring is to have an electrician hard wire these into the main supply for the home. Alternatively, they can be plugged into a socket if any exist in the attic space. Those who care for the environment can also power these from solar panels on the roof. As attic fans are metal then they must be fitted properly, and we would recommend using an electrician or at least seeking advice. The attic fans must be grounded in case of lightning strikes. Another important thing to know when fitting a fan or fans in your attic or roof space is the actual size of the attic. When you buy a fan it should tell you what size it can comfortably cope with and cool down. It should say something like “cools attics up to 2,000 square feet. To find out the size of the attic multiple the length by the breadth and you will know the size. For example, 50 feet by 30 feet attic would be 1,500 square feet. 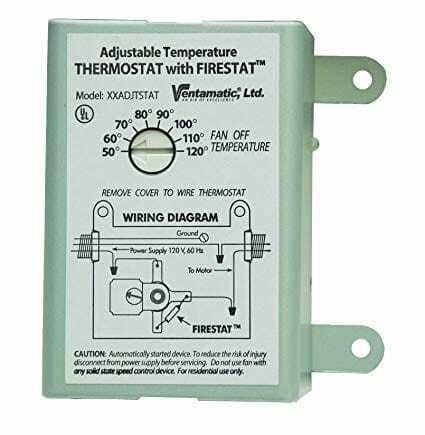 We would recommend using an adjustable thermostat. It allows the user to be able to set and forget the fans and allows to control the temperature that you want to have. As the weather and temperature changes, you can then easily make a new setting quickly. Attic fans can either use a simple on/off switch to control the fans or more commonly they use a thermostat that automatically kicks in at whatever temperature setting is selected. The thermostatic control is always the better option in our opinion. Rather than have to switch the fan on and off, it is much better if the temperature is automated. And then it will always keep your attic at a constant temperature, without you having to worry about it at all. We’ve established that attic fans are very useful for keeping your attic cool and reducing the burden on the air conditioning. So now let’s take a look at some of our top picks. These attic fans are robust, efficient and effective at cooling the attic space in any home. Natural Light brand solar attic fans are quickly installed on a roof. And are highly ranked by developers. The Solar panel is adaptable, and the Fan can mount on 3/12 to 12/12 pitch roofs. However, it is not suitable for horizontal roofs or side wall mounting. The fan can exhaust up to 1628 cubic feet per minute, and you’ll need one attic fan for 2625 square feet. Industry Leading 25-year limited warranty on the entire unit. No battery charging for night operation of the fan. Optional thermostats and fire safety switches for this model are sold separately. 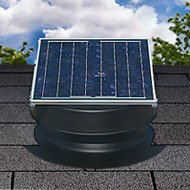 You can’t go wrong with a solar attic fan like this one if you want to have a hassle-free experience. The fan runs continuously on its own as long as there is sunlight. Easy-to-install and setup, it doesn’t get much better than this. The Broan 353 1140 CFM Gable-Mounted fan has a quiet, high-performance operation for cooling the attic. It has a precision balanced 14" diameter steel blade designed for greatest air movement and least noise. It also features an automatically adjustable thermostat. And a permanently lubricated motor that will ensure trouble free operation for years. Built-in thermostat for automatic ventilation. Thermally protected permanently lubricated motor. Some customers complained of noise and vibration. It is a good attic fan for the budget conscious buyer. The Broan 353 is a fan that will get the job done and effectively cool your attic on hot summer days. This is the second Solar Powered Attic Fan on our list. It is a great choice for environmentally conscious people. Powered entirely by free solar power, this effective attic vent is small, silent and strong. Natural Light Solar attic fans are known for their high patterns for excellence and functionality. And they are backed by a 25-year product warranty, the biggest in this type of business. Typically the installation takes just 1 hour, and the fan can be installed in the gables of your rooftop. The entire setup also qualifies for solar tax credits, saving you more money. It is commonly used in private homes with an actual gable vent. With capacities of up to 1,339 cfm, the Natural Light Energy Systems 24-W Solar Attic Fan can vent up to 2,100 square feet. Easy installation takes around 1 hour. Despite the higher upfront cost, the solar fan will run of free solar power. No battery charging feature to run the fan at night. Thermostat and fire safety switch have to be purchased separately. Get this fan if you’re interested in lower utility bills and are environmentally conscious, as it will run continuously during the day off a solar panel. It doesn’t come with an included thermostat though, so it will just run non-stop as long as there is light. 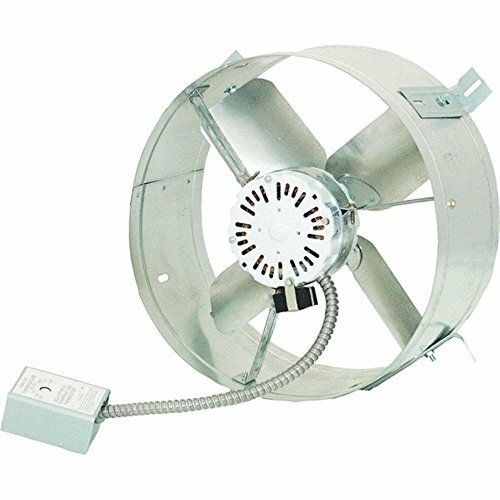 This Ventamatic is a 1650 CFM Power Attic Gable Mount Ventilator has an automatic thermostat, and a galvanized steel flange. It is easily installed in the roof. It has a 25-inch fan built from galvanized steel with a 624-square-inch intake. 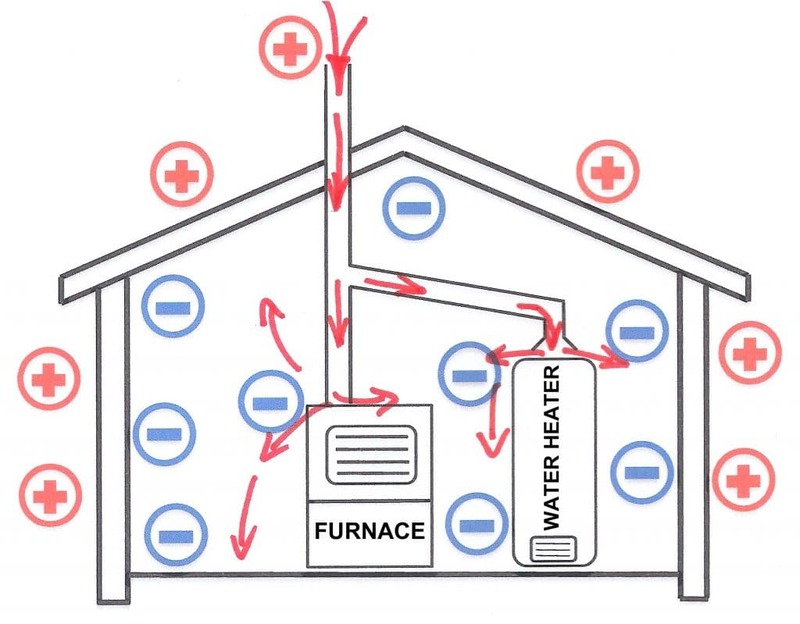 It cools attics up to 2500 square feet which helps reduce utility costs. As it is an exhaust vent, it needs at least 624 sq. to work securely and accurately. Won’t alter your home’s roofline and needs no additional holes. Some noise and vibration issues. The installation gets more complicated in some cases. 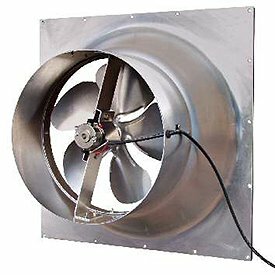 This fan offers plenty of power for ventilating and cooling even large attics. It is efficient in increasing airflow and will help you reduce your utility bills. 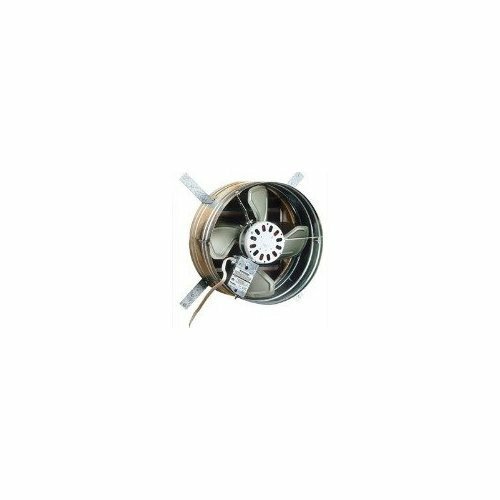 The 1600 CFM Broan 35316 is a small and efficient attic fan that can evacuate up to 2280 square feet of space. It has great performance using its 14-Inch diameter steel blade specifically made for great air flow. The galvanized steel gives it strength. And the brackets are designed for easy installation. It operates automatically using an integrated and adaptable thermostat. And with a thermally protected and lastingly oiled motor. It can be used with Broan model 433 Automatic Shutter, that you can find individually. Or with Standard HVI Wood Louver (not covered). Galvanized steel construction ensures durability. A good attic fan for the budget conscious buyer. The Broan 35316 is a fan that will get the job done and effectively cool your attic on hot summer days. 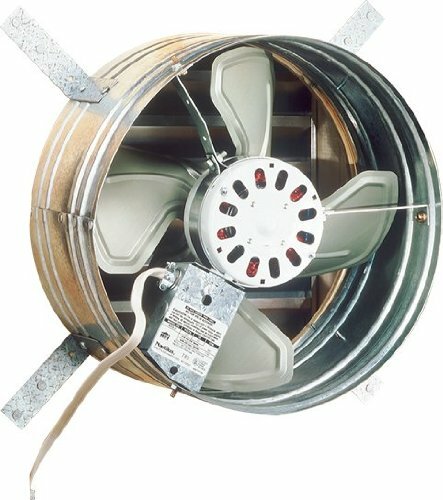 This 1300 CFM Power Attic Ventilator fan has a galvanized steel flange, a thermally protected motor, and an electronic thermostat. And it allows cooling your attic whenever it gets too warm. It mounts easily in the housetop of your home. It will present ventilation without changing your roofline, or where roof-mounting is impossible. It has a 14-inch fan with a 600-square-inch intake. It is galvanized steel production, and it cools attics up to 1,850 square feet. With a thermally protected motor. The unobtrusive design blends in well. It has a built-in thermostat for automatic ventilation. The galvanized steel construction ensures durability. Some customers complained of noise and vibration after some years of operation. The metal surround is cheaply made. And if one does not get the position of the fan perfectly, the blades will hit the bolts of the mounting brackets. If installed correctly, this fan will give years of efficient cooling in your home’s attic and will keep the temperature at the required setpoint using the thermostat. While not that well known, attic fans can be very efficient at cooling the attic and reducing the air conditioning burden in your home. As they become more widely known, they are bound to become more popular. You can usually install them on your rooftop, but be sure to read reviews and follow the instructions properly. You might want to go through our recommended picks for some models. They offer great value and features, including solar fans.